Home Prices Tick Up, Housing Market Recovery May Be Strengthening : The Two-Way The S&P/Case-Shiller Home Price Indices showed gains in nearly all major cities during April. While prices are still down from their boom-time highs, a recovery may be building. 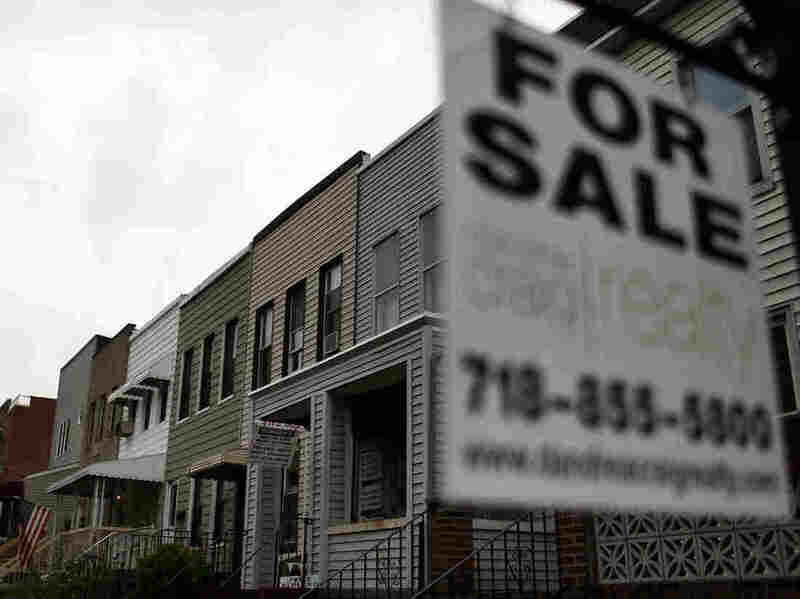 This "For Sale" sign was hanging outside a home in Brooklyn, N.Y., earlier this month. Home prices rose in nearly all major U.S. cities in April from March, according to the latest S&P/Case-Shiller Home Price Indices report. "It has been a long time since we enjoyed such broad-based gains," David Blitzer, chairman of S&P Indices' index committee, says in that report. "While one month does not make a trend ... [the news] is a good sign." -- Detroit was the only one of 20 major metropolitan areas to see home prices fall in April. They dropped 3.6 percent in the Motor City from the month before. -- The largest increase for the month was San Francisco's 3.4 percent. -- In Phoenix, where the housing sector was hit particularly hard when the real estate bubble burst, prices were up 8.6 percent from April 2011. -- The indices' 10-city and 20-city composite indexes were both up 1.3 percent in April from March. But, both of those broad measures were still down from a year earlier — the 10-city composite by 2.2 percent and the 20-city composite by 1.9 percent. Bloomberg News notes, however, that the 20-city index's decline from a year earlier is the smallest such year-over-year drop since November 2010. Reuters points out that the month-to-month increase in the broader measures of home prices is the third such gain in a row, "suggesting the recovery in the housing market is gaining traction."